Semi-automatic washing machines are the most economical of all types of washing machines out there. Because they do not require a constant supply of water like its automatic counterparts and consumes less power as well. These factors make the semi-automatic washing machines a favourite choice among the Indian households. Here, in this article, we are going to discuss the seven models we think are the best in this category of washing machines. LG makes some of the best washing machines in the world, innovating with features that are often the best as well as the first in class. The LG P7550R3FA is a semi-automatic washing machine with an intake capacity of 6.5Kg which comes at an enticing price tag of just Rs.9,999. The chassis of this washing machine is made of plastic so is its drum inside. Plastic drums are the norm for these semi-automatic machines as it will help the companies reduce costs significantly. The 6.5Kg capacity makes this machine suitable for a small-sized family of three to four members. The compact form factor helps this unit fit even in tight spaces comfortably. The controls on the machine are very basic and it doesn’t come with an information display. It has three different wash programs for handling different types of fabrics. The lint from the fabric is collected on a separate lint collector that keeps the water pipe unobstructed for the free flow of water. The inbuilt collar scrubber helps in removing stains from the collar and cuffs easily in no time. This machine comes with a rat repellent cover coated with a chemical to keep the rodents away. The roller jet pulsator helps in double axis motion of the fabric inside the drum which ensures thorough and efficient wash cycles. The added friction loosens the dirt and stains that are stuck deep inside the fabric material. 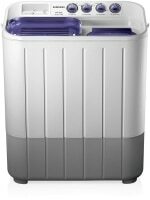 The wind jet dry function allows faster spinning of the tub with enhanced airflow that will dry your clothes quickly. The air vents will keep the tub dry from moisture preventing any microbial growth inside. This semi-automatic washing machine from LG is powered by a motor which runs at 1300 rpm with a rated consumption of 400 W electricity. The machine comes with a 2-year comprehensive warranty to cover all the maintenance if any occurs in due course. The LG P7550R3FA 6.5Kg semi-automatic washing machine is apt for a small/medium sized families up to four members. The roller jet pulsator rinses and washes the clothes very thoroughly but without damaging the fabrics. For a budget just under Rs.10,000, this is probably one of the best you can get in the market at present. Whirlpool is a world class leader in refrigeration and air-conditioning equipments. The company has a series of products in the Indian market that ranges from budget to premium segments. The Superb Atom 70S is a budget semi-automatic washing machine with a 7 Kg capacity that is well suited for an average Indian family to wash their clothes and other fabric. The design and aesthetics of this washing machine are similar to the Whirlpool 62I. The chassis is made of high-quality fibre that is very tough and resistant to minor dents unless you bang a hammer right on to the machine (Please don’t). The Whirlpool Atom 70S has a 7Kg capacity that is sufficient for a family having 3-5 members. Most of the urban families in India fall into this category and hence this product is a perfect choice for them. The soak function on this machine lets you thoroughly soak the laundry in the tub for the detergent to get inside the fabric lining and loosen the dirt and stains. This will help the clothes be cleaned easily during the main wash cycle. Advanced functions like auto-restart until recently was seen only in expensive fully automatic washing machines – but not anymore. The auto restart function on this washing machine is one of the most desired features in washing machines that have to be made a mandatory addition. When the power goes out and then comes at a later time, the machine automatically resumes the wash cycle from the last saved position in the memory. This feature saves time as well as reduces the wastage of water, detergent and electricity. The 340W motor on this whirlpool semi-automatic washing machine runs at 1450 rpm. The faster spinning speed equates to efficient wash cycles and quicker drying of your clothes. This device comes with a 2-year comprehensive warranty that covers the wash motor, spin motor and other electrical components such as timers as well. The Whirlpool Superb Atom 70S is the perfect washing machine for medium sized households. With features such as auto restart during a power failure, this machine is designed with the common people in mind for sure. A great product from a great brand accompanied by a two-year comprehensive warranty – there’s nothing much to go wrong. Panasonic is a relatively new entrant to the washing machine category in the Indian market. With the NA-W65B2RRB, the company has provided a small and compact semi-automatic machine with a capacity of 6.5Kg, sufficient enough for a small sized family. The main USP of this washing machine is it’s small and compact form-factor. Even though it has a 6.5Kg capacity, it is smaller than a 6.2Kg or even 6Kg machine for that matter. This machine will be a boon for those who face space crunch in their homes. The polypropylene body of this machine is really tough and durable. The drum plate inside is also made of plastic and has been lined with ridges and grooves in order to enhance the friction between the clothes and the plate. The aqua water-filter that comes with this machine traps the dirt and sediments in the inlet water that goes into the drum. This ensures that only clean water is used during the wash cycles. The pre-soak function loosens the dirt and stain on your fabric and makes the main wash cycle more efficient as it will be able to remove that loosened dirt and stains much easily. With this machine, you won’t find the leftovers of detergents on your fabric after the wash. The Aqua shower rinse technology assures the removal of all of the detergent particles during the main wash cycle. This washing machine has a 350W motor that runs at 800 rpm. The energy consumption is a bit on the steeper side when compared with the similar models available in the market currently. If energy consumption is a make or break concern for you, then be sure to check out our list for the best power efficient fully automatic front load washing machines. If you’re a bachelor or live in a small apartment, the main consideration you should take in to your mind is the availability of the space. The Panasonic NA-W65B2RRB is such a compact washing machine that will fit well in tight spaces without compromising on the quality of washing process. With a powerful motor inside, this semi-automatic washing machine is perfectly capable of cleaning and washing your clothes at will. It’s small and very compact as well as priced considerably cheaper at around Rs.4,999. Onida was once one of the popular TV manufacturers in the Indian market. With the dawn of new companies, Onida lagged behind and disappeared altogether. Recently the company is making a comeback with the release of appliances such as LED TVs and washing machines in the country. The Onida S80SCTR is a semi-automatic washing machine that comes with an 8Kg capacity which makes it suitable for large families with a lot of clothes to wash at once. Made of high-quality fibre, the Onida S80SCTR has a two-tone colour finish that imparts the machine a typical budget washing machine look and feel. This washing machine does feature a rat filter which is a common problem in many Indian households. Being a fibre body, you wouldn’t have to worry about corrosion or rust affecting the lifespan of this device. The mobile castor wheels at the bottom of this semi-automatic washing machine make it easier to move around the house without any help from others. This washing machine features a powerful air dryer that efficiently removes not only the excess water but also the last bit of moisture that’s present on the fabric. The operation knobs are properly marked for easier understanding of how to operate the machine even for a first timer. The spin timer alarm is loud and can be easily heard across multiple walls in the house alerting you of the washing process being completed. Onida has provided an inbuilt brush for scrubbing purposes. Many clothes will have dried stains that won’t go unless you scrub it manually. With the brush inside, it’s not a problem anymore for searching for one while washing the clothes. Powering this washing machine is a 1350 rpm motor rated at 360W. Higher the rotating speed faster will be the time required to dry the clothes. For a washing machine of 8 Kg capacity, the 1350 rpm motor will easily wash about 12-14 clothes at a single time. The motor generates powerful water flow action and the special drum design ensure perfect cleaning of your fabric without any damage during the washing process. The Onida S80SCTR 8Kg semi-automatic washing machine is a great choice for you if you have a large family at home. With helpful additions such as built-in scrub brush and an efficient lint filter, this washing machine is one of the best high capacity washing machines for a budget under Rs.15,000. Samsung is one of the best brands in the market that many people consider as their go-to manufacturer of home appliances. The Samsung WT725Q is a 7.2 Kg semi-automatic washing machine which packs some neat tricks up its sleeve. The body of this washing machine is made of high-quality rustproof polypropylene. It promises long-lasting durability and will remain shiny as new for the years to come. The inner drum is made of plastic and has embossed grooves and ridges on it. Air turbo drying is one of the main features of this semi-automatic washing machine. spins along with the intake of air. and washed thoroughly against the carefully crafted ridges on the sides mimicking a washboard effect. The integrated scrub board on this machine help you rub the fabric gently on the ridges and grooves to remove hard stains efficiently. The 340W motor on this machine rotates at 1000 rpm. The quality of the motor used in this washing machine is on par with the expensive fully automatic front load washing machines in the market. The faster spin times along with the double storm pulsator technology cleans your laundry efficiently and aides for quick drying. The Samsung WT725Q is a compact yet capable semi-automatic washing machine that features a powerful motor that spins at 1000 rpm. The double storm technology lets the water stream in two different directions – horizontal and vertical and cleans the fabric thoroughly. Having 7.2Kg capacity, this product is very apt for medium-sized families. This concludes our list of the best seven semi-automatic washing machines available in the Indian market. We have tried our best to pick models around all possible subcategories considering the price, size, brands as well the features that this machine comes with. If you have a slightly more relaxed budget, we’d recommend you to take a look at our best fully automatic top load and fully automatic front load washing machine articles. If you did end up liking these buying suggestions, do subscribe to our weekly newsletter to get notified of our articles right in your inbox. Till we meet you with our next awesome buying suggestions, adios and have a nice day ahead. Are you a first timer looking for an entry level cheap washing machine? Most probably, you would be aiming at a semi-automatic washing machine. if you’re and confused about what to look for – Welcome. In this article, we will guide you through some of the aspects that you should keep in mind while purchasing a semi-automatic washing machine in India. Without any further ado, let’s roll. Semi-automatic washing machines are the cheapest type of washing machines available in the market. Why are they cheap? These washing machines come with two separate compartments for washing and drying. The advanced wash programs which are present in the fully automatic washing machines are absent as well. The price? Semi-automatic washing machines start very cheaply. For eg., Intex WMS62TL, a 6.2Kg semi-automatic washing machine is priced at just Rs. 6,999 in India. You can find decent semi-automatic washing machines under Rs. 10,000 in India both online as well as offline. There are models that are priced similarly as an automatic washing machine as well, but with higher capacity of course. The 8Kg LG P9037R3SM semi-automatic washing machine is priced just under Rs. 15,000. Our advice is that, if you aim for a higher capacity washing machine, always go for an automatic model. Capacity is relative to the number of people using the washing machine. For a family of just two, a 6.2Kg machine is more than enough. Be careful not to overshoot your estimate. Take note of the amount of laundry you wash for a week and plan accordingly. Semi-automatic washing machines are available in all capacities ranging from 5.8Kg to 10Kg+ and upwards. The Whirlpool Superb Atom 70S is a 7Kg semi-automatic washing machine priced at just Rs. 9,099, suitable for a family of four members. Remember, overloading a washing machine above its prescribed limit can damage the motor inside. It’s very important to have a rough estimate about the capacity rather than having only a budget in mind, to begin with. Cheaper prices do come with a caveat most of the times. In the case of semi-automatic washing machines. it’s the build quality. Most, if not all the semi-automatic washing machines come with a plastic chassis as well as a plastic drum inside. Plastic drums are inferior to the steel ones in performance as well as durability. But, there are companies providing rust proof, durable drums as in the case of LG P9037R3SM, an 8Kg semi-automatic washing machine priced at Rs. 14,600. Don’t expect anything fancy like an LED information display or soft touch buttons on a semi-automatic washing machine. As a cost-cutting measure, the control panels on these machines always have plastic knobs in place. Semi-automatic washing machines may act very rough with your clothes. No matter what the fabric is, there’ll be probably only one wash mode. Do take proper care when washing your expensive and delicate clothes in a semi-automatic washing machine. If you are still inclined to wash them, do it separately and never mix and wash such clothes with hard fabric like jeans. Also, there won’t be any scrubbing action inside the drum to remove dirt/stain from the collars. You would have to do them manually. Some semi-automatic washing machines like the Whirlpool Superb Atom 70S priced at Rs. 9,099 do offer a scrubbing pad outside. Are semi-automatic washing machines efficient? Yes. Are they better at ashing clothes than, say a fully automatic washing machine? No. Most of the semi-automatic washing machines will clean your clothes to the level your eyes can’t notice the difference. The efficiency of a washing machine is dependent on a lot of factors. The type of water, amount of detergent added and the speed and features of the drum inside. For starters, these machines offer decent cleaning of your clothes. Semi-automatic washing machines such as the Whirlpool SUPERB ATOM 62I priced at Rs. 8,890 features an impeller type motor inside that efficiently cleans the clothes with the help of friction. Semi-automatic washing machines offer some of the highest spin speeds among all type of washing machines in the market. There are models with spin speeds up to 1400 rpm enhancing detergent solubility in the water and washing cycle efficiency. But, is this increased speeds always beneficial? NO. Higher speeds mean higher the rate of collision between fabrics inside as well the friction with the sides of the tub. Delicate and expensive clothes have the possibility of damage at this higher speeds. Semi-automatic machines skimp on features to reduce the costs. What you will be getting most of the time will be the bare minimum of a washer and a separate dryer. It doesn’t mean you won’t get anything special. There are semi-automatic washing machines with auto restart feature that will resume the wash cycle from the last loaded memory in case power goes out in between. The Whirlpool Superb Atom 70S is a 7Kg semi-automatic washing machine priced under Rs.10,000 having auto restart feature.